I got home yesterday to find Tom on the breakfast table devotedly taking blue crab after blue crab and picking their luscious crabmeat out of the shells and into a pile on a side plate. He looked at me and stated the obvious. Oh yeah, our own crabs - compliments of the crabbing trip his visiting relatives did the day before. So we had about 20 or so crabs, which were supper fresh and ready for some magic. The problem was that I was press for time, tired and in no mood to cook anything. But seeing that Tom had gone thru all the trouble of cleaning about 6 of those crabs, I just simply could not get away in bowing out. So, I’m looking for something that will be quick, easy and fast? Except that the recipes that I had needed over 20 ingredients, 15 of those were nowhere to be found in my pantry or refrigerator, so we had to do this on the fly. And you know, sometimes working on the fly is when creativity kicks in. And in this case beautifully. In a flat dish, pour the ½ cup of panko and put aside. In a deep mixing bowl, combine the mayo, egg, Worcestershire sauce, Dijon mustard, lime juice, chosen herb (I had basil and parsley so I did a bit of both) and the ½ of cup of breadcrumbs. Note: Our fresh blue-crabs was originally cooked with Old Bay seasoning, so I did not put more, but if your crab came from those store-bought containers, you may want to add it to give it a bit of and additional flavor punch. Add the crabmeat to your mixture and fold, making sure not to break it too much. At this point it should be wet, but be able hold when trying to form the patties. The patty should form easily and not be too sticky*. Using a spoon (or ice cream scooper) take some of the mixture, put in your palms and form a ball, then flatten it about 1” thick, making sure it they are nice and round. Take the form cakes and roll into the panko crumbs until coated on all sides, put in a lined (with wax paper or silicone liner) baking sheet and chill for about 10-15 minutes or so (this will help in keeping it together if frying them). After chilling them, take out and cook. If frying them: Melt about 3-4 tablespoons of butter and about ½ a tablespoon of olive oil in a large nonstick skillet over medium heat. 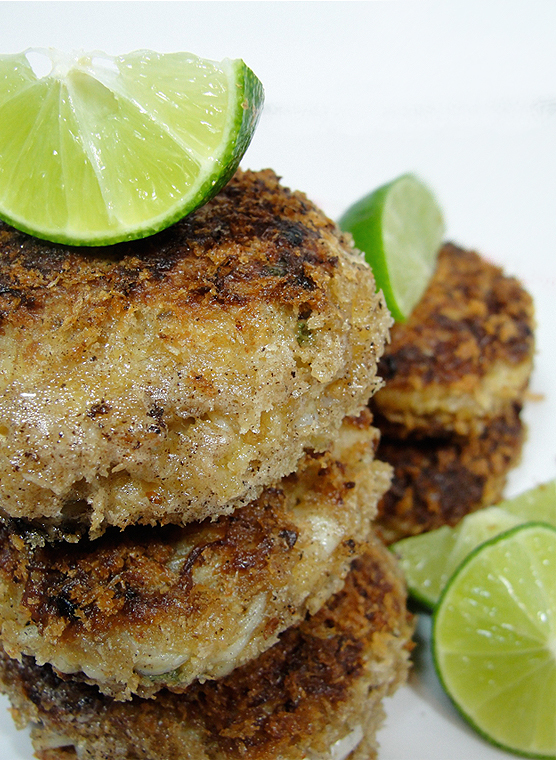 Cook the crab cakes until golden brown, about 3 minutes on each side. If baking them: Turn the oven to 375 degrees. Melt the butter in the microwave and brush the top of the crab cakes with the butter. Bake until golden, about 12-15 minutes, turning them once at the ½ way point. Last night we mixed a bit of mayonnaise, ketchup, lime juice and a 2 or 3 sprints of hot sauce and used this as our dipping sauce.